With the expansion of leading retail supermarkets, the demand for glass door refrigerators has witnessed a new high. The proliferation of restaurants, cafes, pharmacies, and convenience stores are also adding significantly to the growing demand for these refrigerators. As per TMR’s estimations, the opportunity in glass door refrigerators is projected to expand at a CAGR of 8.60% between 2015 and 2023 and rise from a value of US$6.5 bn in 2014 to a value of US$13.7 bn the end of the forecast period. The rising food and beverage industry in Asia Pacific is expected to increase the application of these refrigerators considerably in the coming years. Technical developments are also projected to boost the demand for them in the near future. Mostly, glass door refrigerators with a capacity ranging from 0.5 to 3.0 cu ft., 3.1 to 6.0 cu ft., and 6.1 to 9.0 cu ft. are available in the global market. Refrigerators with capacities of 6.1 to 9.0 cu ft. find high demand in hypermarkets, supermarkets, and convenience stores, owing to which, they have acquired the leading position among all glass door refrigerators in terms of consumption. However, the refrigerators with a capacity ranging from 3.1 to 6.0 cu ft. are the key contributors to the overall revenue generated in the market. Meanwhile, the key manufacturers of glass door refrigerators have started to focus on enhancing the efficacy of refrigerators with capacities ranging 0.5 to 3.0 cu ft. and 3.1 to 6.0 cu ft., which is expected to influence the demand for these refrigerators in the coming years considerably. Regionally, the global market for glass door refrigerators is segmented into Asia Pacific, North America, Latin America, Europe, and the Middle East and Africa. Asia Pacific has been leading the consumption of glass door refrigerators across the world for the last few years. In 2014, it accounted for a share of more than 40% in the overall demand for these refrigerators. In terms of opportunity, glass door refrigerators are likely to find the fastest growth in Asia Pacific at a CAGR of 9.50% during the period from 2015 to 2023, rising from US$2.6 bn in 2014 to US$6 bn by the end of the forecast period. Australia, Japan, China, India, and South Korea are the leading consumers of glass door refrigerators in this region. The rapid increase in the food and beverage industry in these nations is expected to keep the demand for these refrigerators high in Asia Pacific over the forthcoming years. Other regional markets are also anticipated to report healthy growth in the demand for these refrigerators. At the front of the worldwide glass door refrigerators market are Beverage-Air Corp., Hussmann International Inc., Carrier Technologies, and Dover Corp. Other prominent manufacturers of glass door refrigerators are Epta Refrigeration, Standex, Innovative DisplayWorks Inc., Beverage-Air Corp., Haier Inc., Lennox Int., and Manitowoc Co. Inc. This report aims to provide a comprehensive strategic analysis of the global glass door refrigerators market along with the market revenue, volume, and growth forecast for the period from 2013 to 2023. Proliferation of supermarkets, hotels, and cafes, changing food consumption trends, and increasing food safety and quality regulations are some major factors driving the global glass door refrigerator market. A growing retail network and food industry, rise in consumer spending coupled with the development of improved and technologically advanced refrigeration systems is influencing the way glass door refrigerators are being adopted across the food and beverage and retail industries. Other sectors, such as biomedical, are also experiencing increased use of small-sized glass door refrigerators with critical-temperature-control features. This research study on the global glass door refrigerator market provides a detailed analysis of how different retail channels in different regions across the globe are using glass door refrigerators to reduce overall power consumption by using energy-efficient systems. The report offers an in-depth study of the market drivers, restraints, and growth opportunities. Using these factors, the report identifies various trends expected to impact the market during the forecast period from 2015 to 2023. The report includes a comprehensive coverage of underlying economic, environmental, and technological factors influencing the glass door refrigerator market. It also provides the competitive landscape of key players in the glass door refrigerator market in order to highlight the prevalent competition in this market. The report also provides a detailed competitive analysis of key players in the glass door refrigerator market and identifies various business strategies adopted by these leading players. The study explains the penetration of each market segment within various geographies, and how these segments have accelerated the growth of the glass door refrigerator market. The increasing number of supermarkets, fast food restaurants, and cafes is the major driver of the growth of the glass door refrigerator market. A higher number of outlets would generate greater demand for new equipment, while technological developments would help drive the demand for the replacement of the equipment received by the existing stores/outlets. Propelled by increasing competition and maturity in the developed markets of North America and Europe, the retail chain operators are expanding to the emerging markets of Asia and South America. This, in turn, would prompt Asia Pacific and Latin America to become key markets for glass door refrigerators during the forecast period. Based on the capacity, the glass door refrigerator market is segmented into 0.5-3 ft3, 3.1-6 ft3, 6-9 ft3, and others. Based on the retail channel, the market is segmented into refrigerators deployed in hypermarkets, supermarket, restaurants, and convenience store. 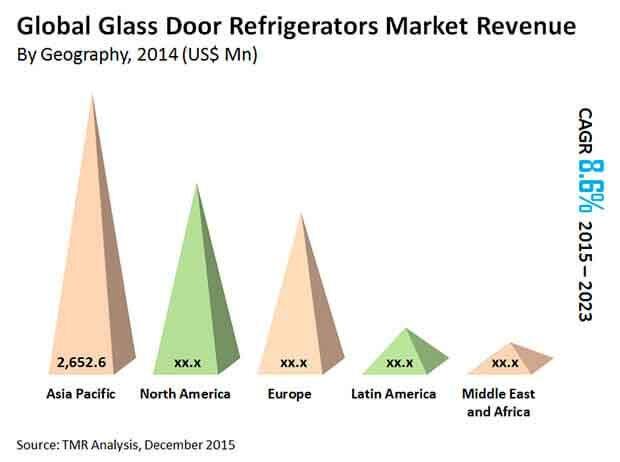 The report aims to provide a comprehensive, cross-sectional analysis of the glass door refrigerators market across major geographies such as North America, Europe, Asia Pacific, the Middle East and Africa, and Latin America. The report includes an overview of market strategies, annual revenues, and the recent developments of key companies operating in the market. The key market participants profiled in this study include Hussmann International, Inc., Hoshizaki International, Carrier, Epta Refrigeration, Standex, Manitowoc Company, Inc., Dalian, Sanyo Cold-chain Co., Ltd, Dover Corporation, Beverage-Air Corporation, and Lennox International. Information on research and development activities, new product launches, and upcoming technologies is also included in the report.